This is the ultimate chocolate pie; rich, silky, indulgent, and yet so light and dreamy that you’ll have finished a piece in the blink of an eye. I don’t know if you’re in this habit but tenting your crusts with tin foil for most of the bake drastically cuts down on singed edges. Just fold a long piece of foil in half lengthwise and gently wrap around the crust before baking. You can remove halfway through or so and allow the crust to get golden brown just as the center bakes. 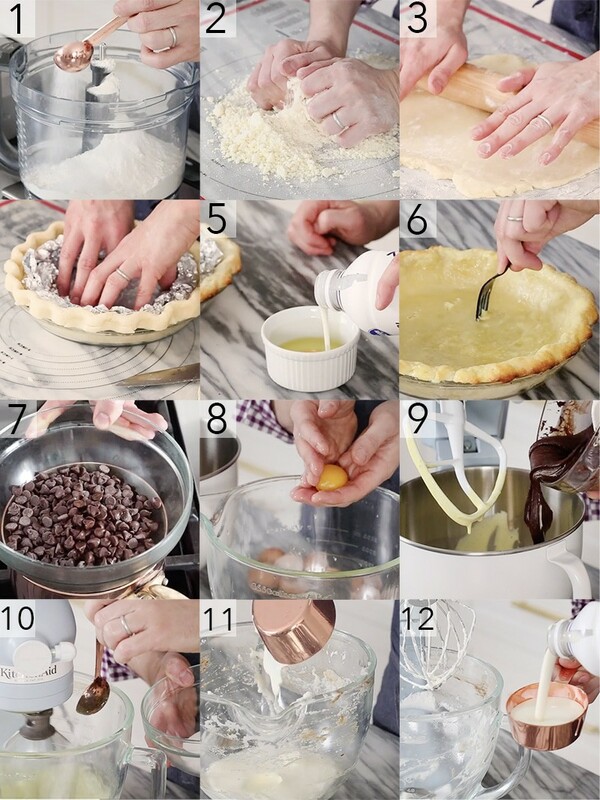 How do you make a simple chocolate pie? Melt and cool 8oz dark chocolate. Whip 1 1/2 cups heavy cream. Fold the melted and cooled chocolate into the whipped cream. This simple concoction can be used to fill a pre-made pie crust, or cookie crust and then served chilled. Does chocolate pie have to be refrigerated? Because of the eggs and dairy in the filling, chocolate pie should be kept refrigerated. Remember to cover before refrigerating so errant smells don’t contaminate your delicious dessert. You can make this pie a day ahead, served chilled and it will be delicious! I LOVE this pie with brandy added but definitely not to everyone’s tastes and it’s not heated so non of the alchohol burns off. Be forewarned! The filling is pretty flexible, you can skip the meringue, omit the eggs altogether, or skip the whipped cream and I bet you’ll still enjoy it! I of course recommend following the recipe, dietary restrictions permitting. Using pasteurized eggs is a good idea, if you can’t find them at your market it’s super-easy to do it yourself! See below for instructions. You’ll need a digital thermometer, a pot and some water. Place the eggs in a small pot filled with enough water to cover the eggs by at least an inch. Bring water to 140F (60C) and maintain that temperature for 3 minutes. Don’t let the water exceed 142F. Remove eggs and rinse with cold water to bring temp down. You can use the eggs right away or save for later in the fridge. What is the best chocolate pie recipe? For the pie crust; preheat the oven to 425 degrees. In a food processor, combine flour, sugar and salt. Whiz together. Grate in chilled butter and drizzle in ice cold water. Mix using a fork. Roll the pastry dough into a ball. Wrap it in plastic wrap or a ziplock bag and refrigerate for 30 minutes. With a rolling pin, on a well-floured surface, flatten out into a circle at least 1 inch larger than the pie pan, rolling from the center to the edge, turning and flouring the dough so it doesn’t stick to the board. Fold the dough in half and ease it into the pie pan without stretching at all and unfold to fit the pan. With a small sharp paring knife, cut the dough 1 inch larger around than the pan. Fold the edge under and crimp the edge with either your fingers or the tines of a fork. Dock your pie crust. Add tin foil to keep your pie crust propped up. Bake at 425 degrees for 10 minutes. Make the egg wash by mixing the egg and a dash of heavy cream together. Take out the tin foil and brush the crust with the egg wash.
For the Filling; Place a heatproof bowl over a pot of simmering water. Add chocolate, coffee and brandy if using. Let it simmer in the double boiler until the chocolate is mostly melted. Take the bowl off the heat and give the mixture a whisk. In a standing mixer fitted with a paddle attachment add 8 egg yolks (set egg whites aside) and ½ cup sugar. Whip on high for about 4 minutes or until a light lemon color. Go ahead and add the chocolate mixture to the whipped egg yolks and give it a mix then transfer it to a large bowl. Add a whisk attachment and a clean bowl to your standing mixer. Add the 8 egg whites, 2 tbsp sugar and a pinch of salt. Whip until stiff but not over whipped peaks. Fold in ¼ of the whipped mixture to the chocolate mixture. Lightly whisk together then add in the remaining whipped mixture until combined. Put the egg white bowl back on the stand mixer fitted with a whisk attachment. Add 1 1/2 cups heavy cream and 1 tbsp sugar. Whip until soft peaks form. Fold the whipped cream into chocolate mixture. This will give the mousse more structure and creaminess. Pour the filling into the baked pie shell and refrigerate for at least two hours. For the Whipped Cream Topping; add heavy cream, sugar and vanilla to a stand mixer. Whip on high until you reach soft peaks. 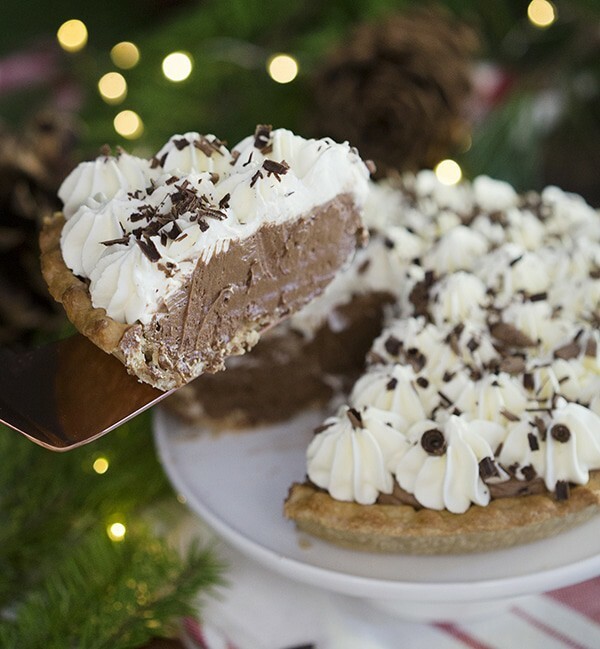 Once your pie is set, add the whipped cream to the top of the pie and sprinkle on some shaved chocolate. 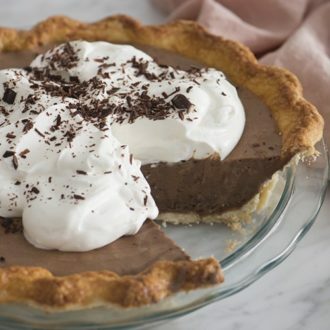 If you’ve tried this chocolate pie then don’t forget to rate the recipe and let me know how you got on in the comments below, I love hearing from you! 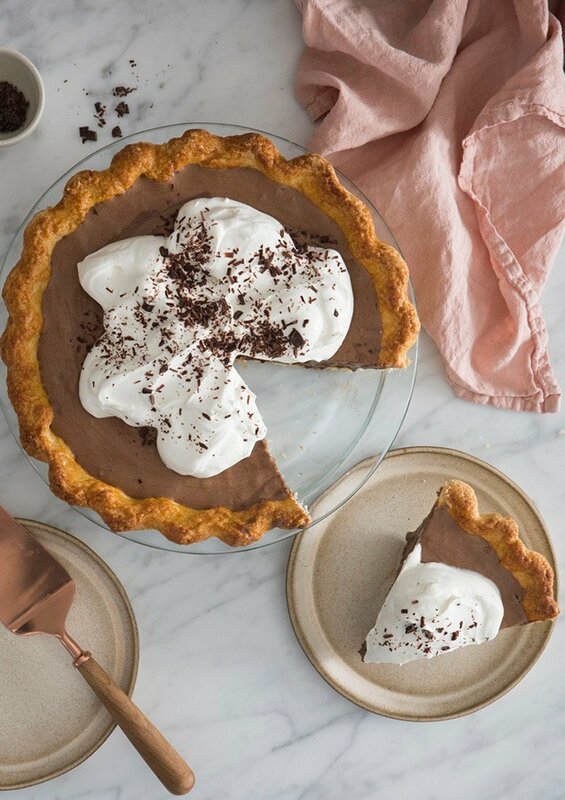 This is the ultimate chocolate pie; rich, silky, and indulgent yet so light and dreamy that you'll have finished a piece in the blink of an eye. In a food processor, combine flour, sugar and salt. Whiz together. Grate in chilled butter and drizzle in ice cold water. Mix using a fork. Roll into a ball. Wrap in plastic and refrigerate for 30 minutes. Cut the dough in half, set one half to the side. With a rolling pin, on a well-floured surface, flatten out into a circle at least 1 inch larger than the pie pan, rolling from the center to the edge, turning and flouring the dough so it doesn't stick to the board. Fold the dough in half. Ease it into the pie pan without stretching at all and unfold to fit the pan. With a small sharp paring knife, cut the dough 1 inch larger around than the pan. Fold the edge under and crimp the edge with either your fingers or the tines of a fork. Dock your pie crust. Add tin foil to the inside, pushing it against the edge of the crust. This will keep your pie crust propped up during backing. Bake at 425 degrees for 10 minutes. Take out the tin foil and brush crust with an egg wash. Dock the pie crust. Add foil around the sides. reduce temperature to 375 degrees and put in oven until the center is golden. Place a heatproof bowl over a pot of simmering water. Add chocolate, coffee and brandy if using. Let it simmer in the double boiler until the chocolate is mostly melted. Take the bowl off the heat and give the mixture a whisk. Add the chocolate mixture and mix. Add a whisk attachment and a clean bowl to your standing mixer. Add the 8 egg whites, 2 tbsp sugar and a pinch of salt. Whip until stiff but not over whipped peaks. Fold in ¼ of the whipped mixture to the chocolate mixture. Lightly whisk together. Fold in the remaining whipped mixture to the chocolate until combined. Put the egg white bowl back on the stand mixer fitted with a whisk attachment. Add 1 1/2 cups heavy cream and 1 tbsp sugar. Whip until soft peaks form. Fold the whipped cream into chocolate mixture. This will give the mousse more structure and creaminess. Add heavy cream, sugar and vanilla to a stand mixer. Whip on high until you reach soft peaks. Pour the filling into the baked pie shell and refrigerate for at least two hours. Add the whipped cream to the top of the pie. Sprinkle on some shaved chocolate. I LOVE this pie with brandy added but definitely not to everyone's tastes and it's not heated so non of the alchohol burns off. Be forewarned! The filling is pretty flexible, you can skip the meringue, omit the eggs altogether, or skip the whipped cream and I bet you'll still enjoy it! I of course recommend following the recipe, dietary restrictions permitting. Using pasteurized eggs is a good idea, if you can't find them at your market it's super-easy to do it yourself! Just place the eggs in a sauce pot and cover with water. Heat to 140F and maintain that heat for 3 minutes. This was a great activity for my kids. They loved helping me making this exquisite pie.